The aforementioned fiddler/violinist is Joshua Bell, whose concert at Suntory Hall in Tokyo is worth watching/hearing in full (part 1 of 5 is linked). For relaxing times, make it Suntory time. One of the strongest, most-repeated findings in the psychology of belief is that once people have been told X, especially if X is shocking, if they are later told, “No, we were wrong about X,” most people still believe X. God help us; it’s a wonder we can tie our shoes in the morning. By the way, if you’re interested in more of Errol Morris-esque inquiries into “unknown unknowns” (Rumsfeld), I’d highly recommend the book The Black Swan by Nassim Nicholas Taleb — it is, unlike the faux-revelations of Malcolm Gladwell, a true paradigm-shifting (I use that word deliberately) work. Plus, Taleb will spare you years of agony having to learn the same things via the poker table… trust me, reading is quite preferable to bad beats in Texas hold ’em. without fail, they have been right. For more on forgetting and the consequences of a poor grasp of history, see “The Tea Party’s Toxic Take on History” (Salon) by Ron Rosenbaum, and “Glenn Beck’s Partisan Historians” (Slate) by Michael Lind. 2. The white privilege of forgetting. Wise says, “Victims have long memories… But those who create that victimization have short memories. We [white people] have the luxury of forgetting.” I thought this dovetailed nicely with a book I just finished, Adam Hochschild’s King Leopold’s Ghost (1998). Hochschild (coincidentally, co-founder & early editor of Mother Jones) has a whole section devoted to the “politics of forgetting,” which in this case means forgetting the mass murder of some 10 million Congolese Africans at the turn of the 20th century. The story told in King Leopold’s Ghost has something for everyone: tragic heroes, back-room political intrigue, crazy familial squabbles — even “one of the most successful feats of pimpery of all time!” Hochschild’s details Belgium’s King Leopold II and his almost single-handed conquest of the Congo (with, of course, the aid & complicity of the U.S. and most of Europe). I, like Hochschild before researching this book, knew very little of this “forgotten holocaust,” save for tidbits of information gleaned from a cursory knowledge of Joseph Conrad. After Leopold’s mad grab for Africa, he personally net $1.1 billion from ivory & rubber trade (begotten from a cruel forced-labor system, not to mention the extermination of half of the indigenous population of the Congo. “The horror! The horror!” Terrible history, but an incredible book. So: winners do write History, but I belong to a religion that, at its best, is for losers, for underdogs, for the down-and-out and the forgotten. And if that religion has too often, much too often, sided with the powerful & the upwardly mobile, there are patches of history where believes have been among the most ardent of prophets speaking truth to power. And King Leopold’s Ghost records the stories of a couple of these people; most prominently, that of African American Presbyterian Rev. 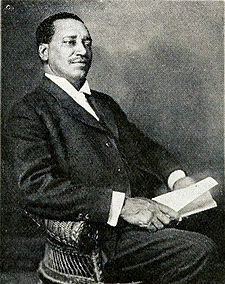 William H. Sheppard. I’ve excerpted Hochschild’s passages about Sheppard and put them into a 10-page PDF; it’s highly recommended reading. The complementary photos I added are from The Presbyterian Historical Society, as found in this article on Sheppard from The Journal of Southern Religion. It’s also interesting to note that in an interesting afterword to King Leopold’s Ghost written seven years after initial publication, Hochschild claims he understated the role of Baptist & Presbyterian missionaries; this seems, in part, to have been the impetus for his 2006 book Bury the Chains, about “prophets and rebels” in the British anti-slavery movement. If you never get to King Leopold’s Ghost, at the very least read the chapters on Sheppard — and seriously, watch those Tim Wise videos.